In Wollongong you will live in a double room in a catered residence with other international and Australian students. All UOW residences conduct a program of orientation activities to help students settle in on arrival in Australia. Residence life staff are available 24 hours a day to ensure that the living experience in Australia is a supportive and rewarding one. A social program called “iLive” is arranged at the housing complex offering students a variety of experiences to enhance their stay. These include themed meal nights, guest speakers, study groups, volunteering and community engagement opportunities and health and wellness programs. Students may select a single room in the housing for a supplemental fee – contact the Admissions Officer for more information. Students living in the University of Wollongong housing will receive 19 meals per week. These include breakfast and dinner Monday through Friday, a “make your own” lunch to take to University and 2 meals per day at the weekend (brunch and dinner). Public transit in Wollongong with a city loop shuttle running all day linking the University with various city hotspots. AIFS students will also receive a travel pass for use in Sydney on arrival which can be topped up during the semester. 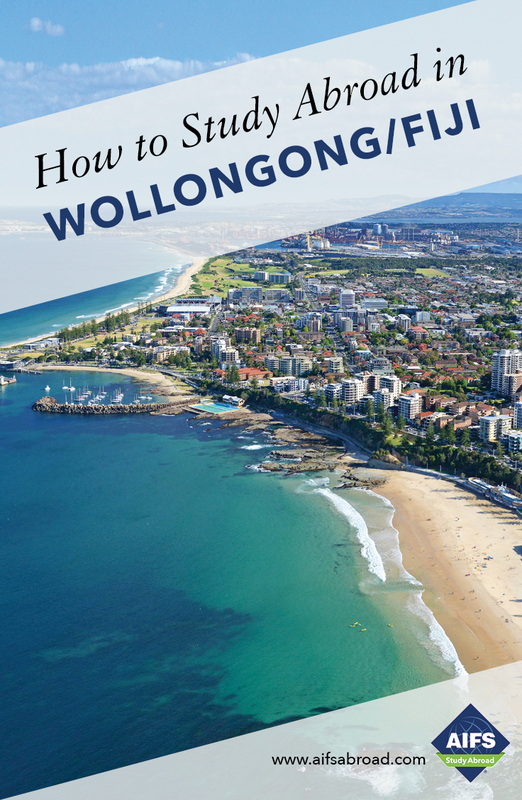 The University of Wollongong includes 18 food outlets, 2 banks, 7 coffee shops, a student travel agent, a campus health center, a hair and beauty salon, a bookshop and convenience store. Three and six-month passes to use the facilities are available at a discounted student rate as well as rates for single use or multi-visit (10 sessions) passes. Students will receive information on this as part of the UOW orientation program. There are 15 sports based clubs on campus and 60 student sports teams. There are over 100 different clubs and societies on campus at UOW. These include academic/faculty-based, charity and volunteering, professional development, political, religious/faith based, recreational (dance, sports, fitness), cultural and special interest clubs. UOWX is an initiative which recognizes the valuable skills and experience students can gain by participating in co-curricular activities in addition to their regular academic work. Students who take part in the wide range of activities that the University of Wollongong offers will receive a UOWX Record, a formal transcript of their co-curricular involvement. Qualifying activities include participating in a seminar which develops leadership or employability skills, volunteering on a University or community project or joining a club or society. More details are available from the Resident Director upon arrival. The CSE offers a number of leadership, training, community engagement and environmental programs which give students the opportunity to broaden their horizons and learn new skills to apply to real world challenges. The Unibar is the center of on-campus entertainment hosting local and international bands as well a variety of weekly events. Movie screenings also take place on campus where a full-size cinema screen with surround sound is used to show the latest releases plus foreign language and art house films. The International Students Program (ISP) offers programs and activities each semester to connect students with people from all over the world. The ISP will include excursions, group meals, cultural adjustment workshops and also volunteering opportunities. Volunteering is a great way to make friends, expand your résumé and develop new skills while becoming involved in UOW and the local community. The International Student Program will update you on all such opportunities during your time at Wollongong. The Australian government requires foreign students to pay for mandatory health coverage (Overseas Student Health Charge). Included in the AIFS program fee, this is paid directly to the provider. AIFS students in Wollongong will be supported by the on-site Resident Director and have access to a team of staff in the University of Wollongong International Office dedicated to assisting visiting international students during their studies. The AIFS Resident Director will assist you throughout your stay, helping explain cultural differences, giving travel advice and also arranging a program of social and cultural activities to help you make the most of your time in Australia. To help your integration into the student community the UOW Global Buddies Program is also available where international students are paired with a local Australian student. The Resident Director provides academic advice, introduces you to the community and handles communication with the University.